The road transport facilities in Tiruchirappalli are regulated by the Government of Tamil Nadu’s undertaking “Tamil Nadu State Transport Corporation (TNSTC)”. TNSTC is wholly owned and served by the Government of Tamil Nadu. Tiruchirappalli belongs to Division 1 of TNSTC with its headquarters at Kumbakonam. There is a couple of ‘Regional Transport Offices (RTO) functioning in Tiruchirappalli region. 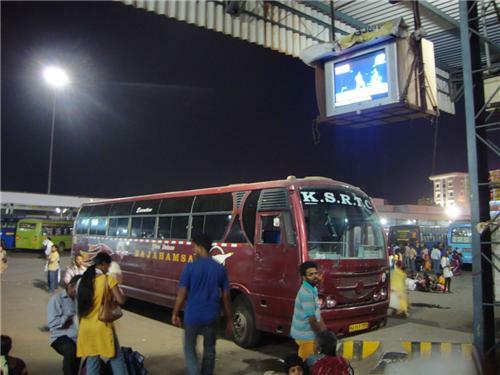 Both the above junctions connect both intercity and intra city buses throughout the year and is integral part of Tiruchirappalli transport. Tiruchirappalli city is well linked to other cities in Tamil Nadu and India by National Highways. There are five national highways in Tiruchirappalli and connecting the neighboring places. The Local buses connect the entire Tiruchirappalli city. The frequency of the local buses makes this city even more amazing as not just the tourist places, but all nooks and corner of the city are very well linked. Some of the varieties of road transportation available in Tiruchirappalli are Government buses, luxurious private buses, Mini buses for sub-urban areas, air-conditioned Volvo buses to Trichy International Airport, Cabs, Taxis, Auto rickshaws and share-autos. The district is also well connected to some of the important cities of South India namely Chennai and Bangalore. The Government of Tamil Nadu provide free bus pass for students, freedom fighters and their legal heirs, blind people and physically handicapped people. The Government statistics state that there are over 90,000 people benefited through various schemes of Bus Pass. Indeed, this serves as a boon for many people in the city as one important factor of a routine life is supported by the Government. Some of the government and private operated bus services from Tiruchirappalli to various destinations like Chennai, Madurai, Coimbatore, Salem, Ooty, Kodaikanal, Bangalore, Ernakulam, Hyderabad, etc on a daily basis are listed below.